Perfect books don't come around too often. In total, I think I've read three of them this year--all completely different--and that seems like an awfully high number. I think it's been a very lucky year. 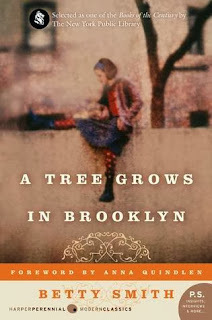 A Tree Grows in Brooklyn, by Betty Smith, is definitely a perfect-to-me book, and I am so grateful that Heather has been bugging me to read it all these years. I bow to your all-knowingness, my friend. Francie Nolan is a smart, resourceful, bookish, underprivileged girl living in the Williamsburg neighborhood of Brooklyn in the early 1900s. Her father, Johnny, is a loving drunk, singing waiter, and all-around nice guy. Her mother, Katie, is a bit hardened by life and does whatever it takes to provide for her family while trying to bring the kids up with a smile. Her brother, Neely, is a typical little brother. Francie's aunts, Sissy and Evy, provide lovely comic relief. I think I shied away from this book for so long because it didn't seem to have a specific angle. No mysterious locales, no crazy characters, no genre element to speak of (besides a bit of the historical). It just seemed to fall into the "family drama" category, and I admit to having attitude when it comes to that very wide open, blanket category. What I actually found between the covers is a remarkable feat of characterization. Every member of the family is so unique but so universal, too. At times I felt like I was sitting back watching Katie and her sisters the way I would've listened in on a conversation between my sassy grandmother and her sisters...all characters in their own right. And beyond the family ties, the location is very much a character of its own. Williamsburg comes alive, from the junk shop to the candy store. The downtrodden, the lonely immigrant, the stalwart populace. I guess part of me also expected a "sweet" book. Given the time period when the book is set, and the fact that it was published in 1943, I thought it would be a lot of goody-goody. But I was wrong there, too. Brooklyn was a rough place. There was a lot of need and poverty. Times were changing and people were just trying to keep up. This book was downright gritty in spots--sexual predators, heavy drinking, brutal pregnancies, hunger, poverty, injury. The priority for Katie, and thus for Francie and Neely, is education. Like any mother, she wants her children to do better than she and her husband. Katie made the children read one page per day from the Bible and one page from Shakespeare in hopes that they would gain knowledge. As a mother, it's a constant worry to try and figure out how to bring little people up with the right priorities. College, learning, curiosity, responsibility. This book is saturated with the story of a mother fighting to help lift her children up. Even though Francie is the protagonist, and this book is focalized by her, I could personally identify with Katie so very much. That definitely added an extra layer of meaning and emotion to the book for me. I could go on gushing about the greatness of this one for a long time, but I'll wrap it up by saying that it carries one of my favorite book titles ever. Symbolically, that is. I won't tell you exactly how it plays in the book, but you won't be disappointed by the analogy. Sometimes strong, sure, scrappy, beautiful things grow and flourish in the darkest, roughest places. Source: Heather gifted me a copy! If you can handle more gushing, watch the video review! I've never read this, but it's one of those that I always say to myself that I MUST read sometime! I would have expected a sweet book too... thanks so much for sharing your thoughts on this! You definitely must read it sometime. It's so wonderfully realistic and kickass! It's definitely one that's going on my re-read someday list. I think in a few years I'll be itching to revisit the characters. This is a 'perfect to me' book, too. My oldest daughter loved to read growing up, but I give this book credit for turning her into an adult reader. That's awesome! I already want my stepdaughter to read it. I think she'd have a hard time getting into it initially, but if she could stick with it, she would fall in love with Francie and Neely and all. Your bow is graciously accepted. I'm just so damn happy you loved it too! I am soooo glad you read this! I know what you mean by not seeing an angle and putting it off. But once you read it, it's like Oh! It works! So glad you enjoyed it too. One of my favorite reads this year. Betty Smith wrote a novel that always felt to me like a "sequel" to A Tree Grows in Brooklyn called Joy in the Morning. I suppose it's unrelated, but it will always be intertwined with A Tree Grows in Brooklyn. I've never read this book and really had no clue what it was about. It sounds wonderful! It is amazing, Kathy. I hope you'll decide to try it! What a perfect review this is! One of my favorites too and I also only read it for the first time last year. Thank you, Kelly! I'm so glad I'm not the only one who waited this long to read it! To second Carrie, I loved Joy in Morning too. That novel is about struggling newly weds. I’m a bit ashamed to say that not only do I not own this book, I’ve never read it. For some reason, I went to the one school that didn’t require it (because if it was required, I WOULD have read it). I really need to, though. Thanks for the reminder! This wasn't one we read in school either, but I remember seeing the cover and blurbs and reviews about it forever. So glad I finally tackled it! I had one of the same misconceptions as you - I thought it would be a sweet book and the main character would be like Pollyanna or something. When I first started reading it, I was a little worried, because there was something a little precious about the writing but I later learned that was on purpose, and had to do with Francie's stage of life at that point. But like you, I just fell in love with all the characters - I loved the relationship between Neely and Francie, which especially is underscored in the end, as they talk about how their little sister's childhood will be so different from theirs. I think I've always put this one off precisely because every loves it so; I'm just sure that I'm going to go into it with expectations that can't possibly be met. I hadn't heard of this at all before starting my blog but then it was suddenly every where I looked. For that reason I popped it straight on my Classics Club list. I think if it is a perfect book, I'd better crack on and get to it. It really is a perfect book. So perfect, in fact, that I'm thinking of having some of its words tattooed on my person. FOR REALS. So glad you loved it as much as so many others have! I enjoyed this one too, even though I shared your initial reluctance to read it because of the lack of clear focus. It's strange, I don't think I ever even knew what this book was about! It's one of those classics I see floating around, have been curious about, but never really picked up. You've definitely made me interested, though! I just read this book for the first time a year ago, and I loved it so hard. Definitely a favorite! Love your review -- and the vlog! I'm over-the-moon that you loved this book. It's one of my favorites and I knew you were reading it this year! Katie was a particularly powerful character to me. She is so strong and holds her family together, but her children don't see her as "fun" like they do their father. It's a reminder that being a good parent can be a thankless job. I think this one needs to be bumped up my re-read list to 2014.
p.s. I agree with your other 2 perfect books too! I have never read this book, but have always meant to. I guess I better make it more of a priority to read with it being one of those perfect books! I LOVED LOVED LOVED this book! I think, like you, I was expecting a sweet book similar to Anne of Green Gables or something, which is not what it was. I saw the movie recently, too - it was very good but not as good as the book. I want to read the semi-sequel to this one, too. So glad to see you loved it! I read this book for the first time a few years ago, and I couldn't believe I'd waited so long! YES it's perfect! Great review. I'd love to read this again and see if I identify with the mother more this time around. Oh, this book :*) One of my all time favorites. It's perfect, definitely. I'm so glad you read it! Sigh, this is a perfect book. I have a memory that I'm not even sure is real anymore of my grandmother giving me this book for Christmas one year. Every time I tried to read it, I could never get into it. After she died suddenly, I was drawn to it again and it was just a perfect book that came to me at the perfect time.